Resolution is defined as a resolving to do something. My guess is that many of us have plenty of things to do. There never seems to be a shortage of action items, to do lists, next steps, and plans to be completed. 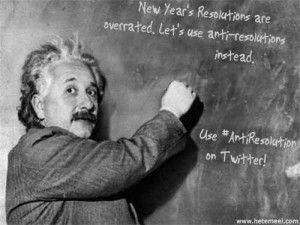 I encourage you to take a few minutes today and make an anti-resolution list. The list should consist of things you are NOT going to do anymore. I think going through this process will free up some time for all those resolutions you made January 1st and will more importantly, free up time for meaningful relationships. Whether those relationships are with donors, clients, friends, or family or if you just use the time to be alone and think, use the time wisely! There was a challenge on Facebook this week that said you should start acting as though everyone in your life was going to pass away before the end of the day. What would you do differently? How would you prioritize your time? What would you decide to skip that day? A while back I read Getting Things Done by David Allen. One of the most profound exercises in that book for me was making of list of how I want to spend my time and how I spend my time currently. Then I was able to cross-reference the lists and see where there were major contradictions. Spending time with my kids was on the ‘want’ list and shopping was on the ‘doing’ list. Now, each time I decide to hit the stores I ask myself if this is really how I want to spend the next few hours. Sometimes the answer is YES! But, it does give me pause and allows me to be purposeful in my actions. What should you stop doing in 2014? Making this list and sticking to it are much easier than a new diet or fitness plan and great results have been shown! Share your anti-resolutions with me on LinkedIn at www.linkedin.com/rachelkarmbruster or post them on Twitter using #antiresolutions and tag me @rarmbruster. Here’s to a happy and purposeful new year!